Continue tracking time even while on the move. 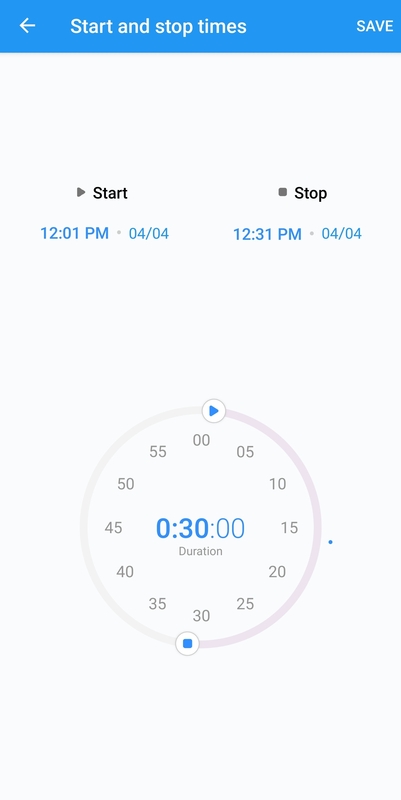 Toggl Timer is a native app for Android designed to help you track time while on the move. It will sync instantly with your Toggl account allowing you to seamlessly switch between tracking on the phone and tracking on the web or desktop. The app will prompt for a login when first opened. If you already have a Toggl account, enter the same credentials. If you forgot the password, use the password reset page to regain access to the account. A Google account can be used for registering or for signing in. 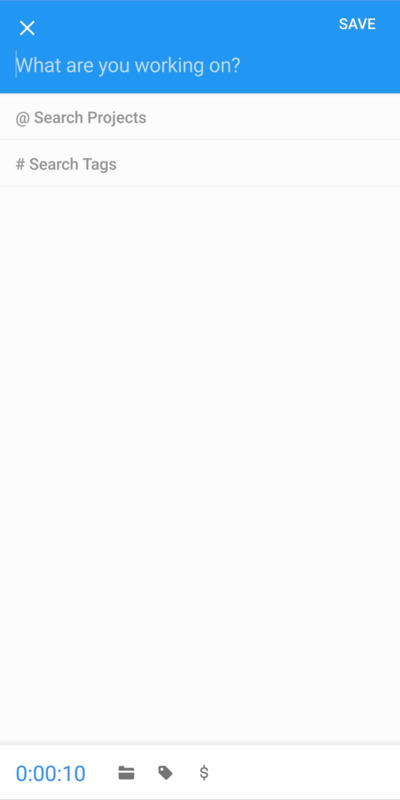 If you have an existing Toggl account but can't sign in with Google, please check whether Google sign-in is enabled by opening the Profile page. For more details on Google sign-in, open this article. After logging in you will see the default/main screen of the app - the Timer screen. From here you can initiate actions such as starting a time entry, stopping a time entry, etc. "Working on these" suggestions - short list of your most tracked activities. Tapping an entry will start the timer for that entry. The time entry log - chronological list of your time entries. Tapping an entry will open the Edit screen and allow you to modify it. Tapping the small "play" button on the right side of each entry will start a running timer based on that existing entry. 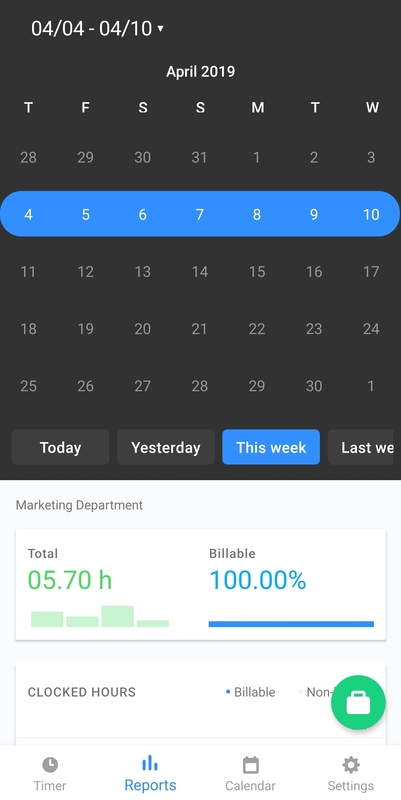 Navigation bar - located at the bottom of the screen are navigation buttons allowing you to access reports, calendar, settings and go back to the timer page quickly from any area of the app. Another important part of the Timer page is the green "play" button which is used to start a running timer, we will cover it more in detail in a dedicated section below. Please be sure to use the "undo" option before it goes away, there are no other ways of reverting the delete action. This screen is opened after starting a new time entry by clicking on the green play button on the Timer page. The image in the above section outlines exactly what each button within the page does. When writing the description you can use shortcuts to quickly insert projects or tags. Use @ to define a project or # to define a tag. To change the duration or start time of your Entry tap the numbers in the bottom left area. This will open the Time Selector. You can read more about further down in this article. When you're finished making changes tap the Save button in the top right corner. Alternatively, tap the X icon in the top left corner to discard the changes. 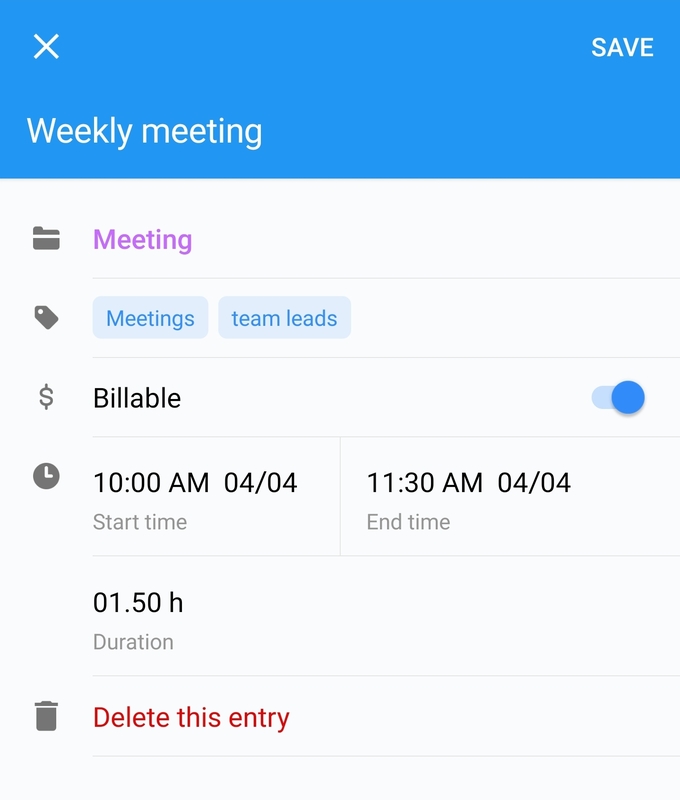 Accessible when you create or edit an Entry, The Time Selector has three places that let you set the start time, stop time, and duration of an Entry. Tap on each value to edit it or adjust the start and end time of the timer entry by moving the "play" and "stop" buttons along the cripple. By default, the timer will start as you create a new entry. You can turn on Manual Mode in the app’s Settings to prevent this from happening. 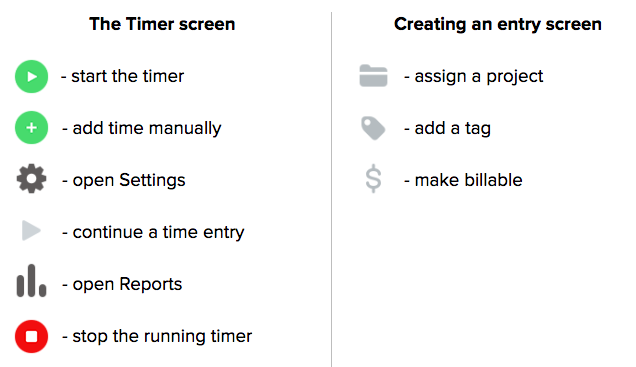 This makes it easier for you to add time later on. When Manual Mode is on, the green play icon on the Timer screen is replaced with a plus icon. Access the Settings by tapping the cogwheel icon from the bottom navigation bar on the Timer screen. 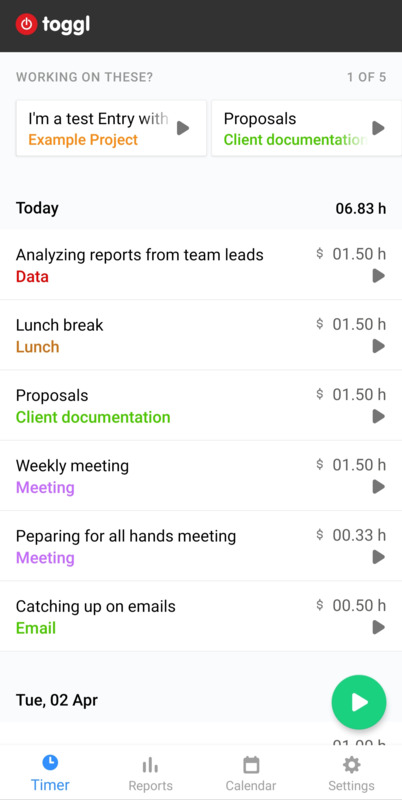 Reports on mobile let you see a breakdown of your tracked Projects over a specific period of time. Please note that mobile reports are limited to your own personal time. For full workspace reports please log in to the web app. 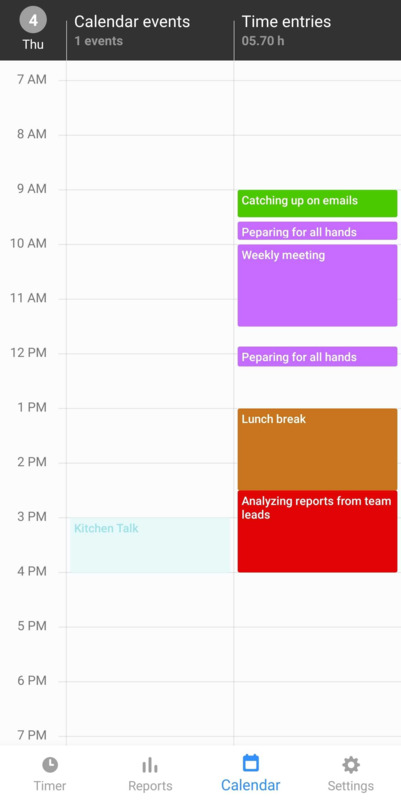 Tap below the dropdown to hide the calendar or swipe up. Note: Reports do not include time entries that are currently running. 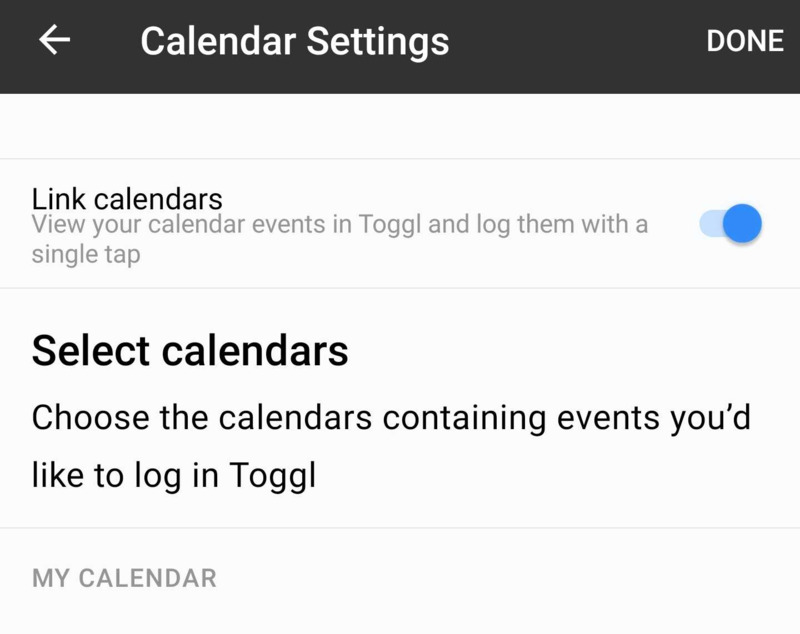 If you choose to get the most out of the Calendar feature you should definitely link up one of your calendars with the Toggl app, even if you skipped this step the first time around the "link calendars" option is still available on the top-right corner of your screen as seen in the above screenshot. 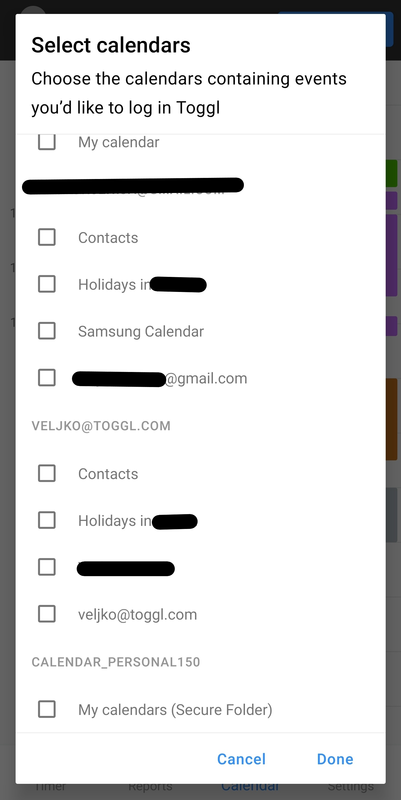 Clicking the "link calendars" button will shop a popup allowing you to choose which calendar(s) you'd like to sync with the app with check-boxes next to them. Select the one(s) you wish to link and tap on "done" at the bottom of the screen. 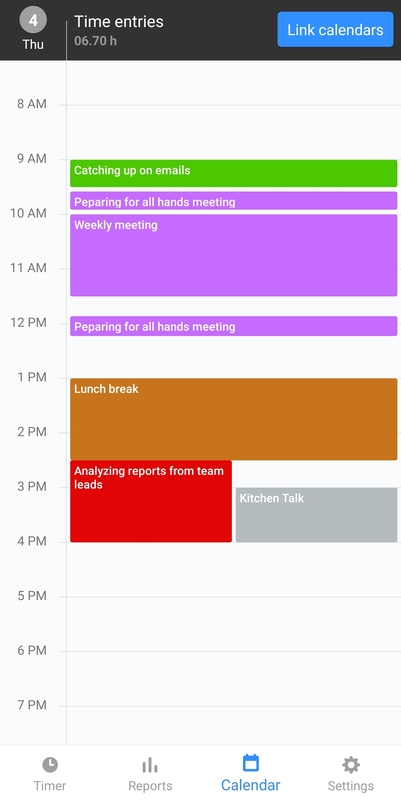 After you link up your selected calendar(s) you will get a split view showing you a split view between the events in your calendar and your existing time entries. 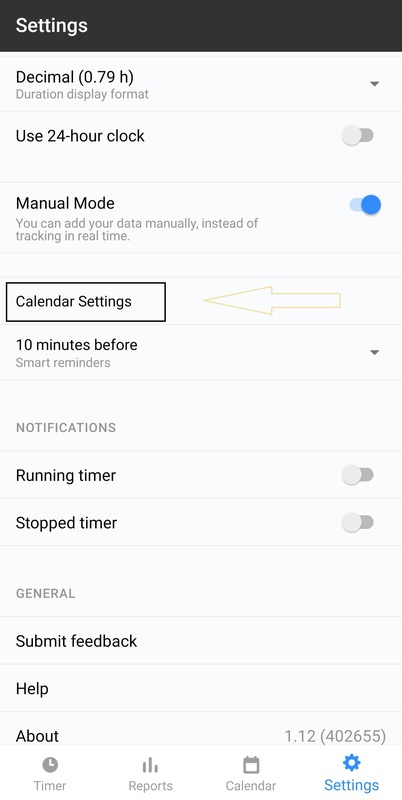 Tapping on an event in the calendar will create a time entry and immediately show it on the right side. When you go back to the timer page the new entry will be shown there as well. I'm an existing user, why aren't there any entries on my Timer screen? To keep syncing on mobile as stable as possible the app will pull only data from within 10 days of your last login. 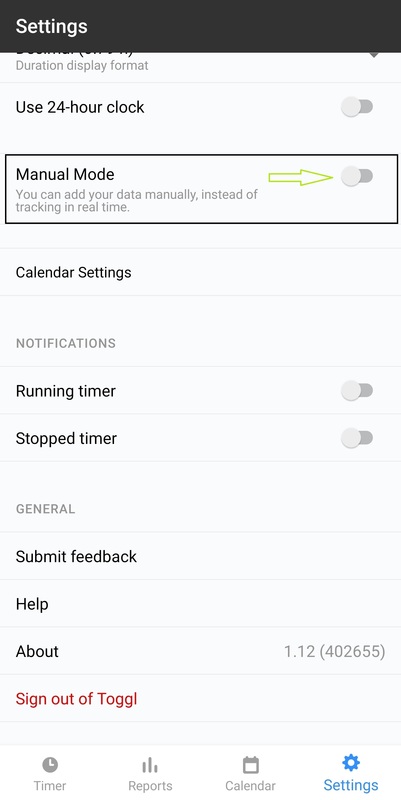 You might not see any data in the app if you haven't tracked time for a while. Open Detailed reports in the web app to review your past time entries.